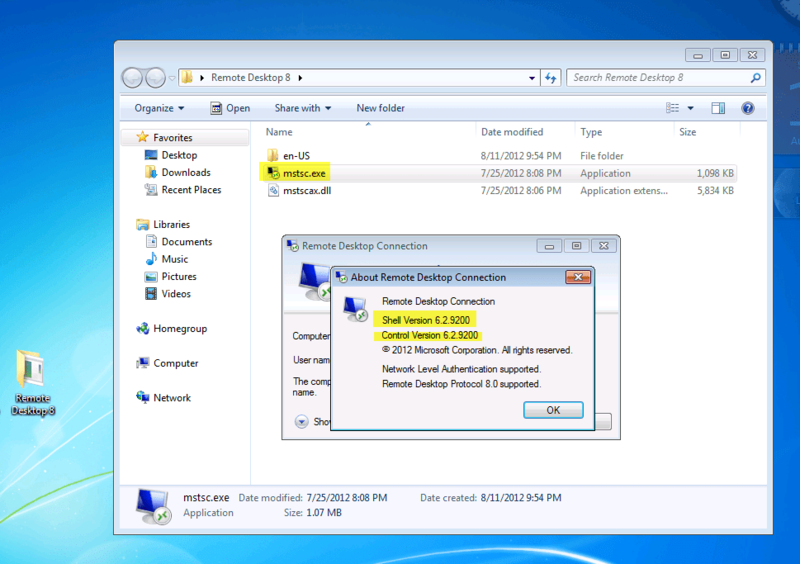 The Remote Desktop Client Connection Software that comes with Windows 8 or Windows Server 2012 features a new menu called the Remote Commands menu. 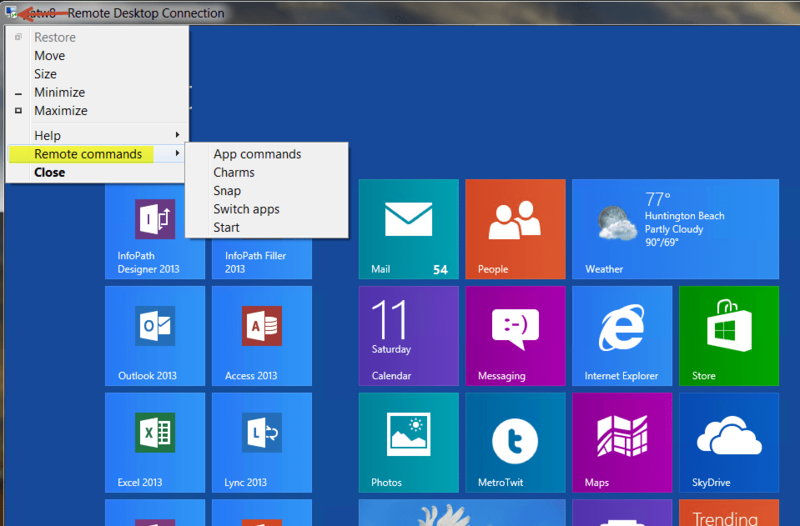 This menu allows you to send special commands, such as a start menu, accessing the Windows 8 / Windows Server 2012 Charms, switching apps, snapping apps and application specific app commands. If you are in a windowed remote desktop session you can access the remote commands by selecting the remote desktop icon and then choosing remote commands. If you are running remote desktop full screen click the down arrow on the connection bar to display the remote commands. Instead of overwriting the existing files on your windows 7 system (in case you ever want to revert back to the old version) create a new folder called Remote Desktop 8 anywhere on your system. I put my folder on my desktop. Now copy mstsc.exe and mstscax.dll to that folder. Inside that folder create another folder called en-US and put the other two files into that. If you’re running a version that is not English then you will need to put the two mui files in the folder that corresponds to your language version. Running mstsc.exe will now launch the new RDP client with the new remote commands on your Windows 7 system. The official Microsoft version has now been released. Check here for links and info or instead of downloading each file from the above link and running them individually get my MS Windows 8 RDP all-in-one combo updater package that automates the process into one installer. I have a folder called en-US and en-GB with the same MUI files inside, same error. works great, but do you have any idea why a TS Gateway connection isn’t supported? Thanks for pointing that out. I don’t use the TS Gateway tab normally so I hadn’t noticed that it was greyed out. I may be missing some dependencies to allow the gateway. Will check into it. did you ever find a solution to the tsgateway button being greyed out issue?